Relax in nature with a visit to Maerua Luxury Safari Tents. Our self-catering accommodation is located inside Marloth Park and within 20 minutes’ drive of the Kruger National Park.As native as the Bead-bean tree (Maerua Angolensis) is to the Kruger National Park, so is staying at Maerua to the bush enthusiast. Maerua is an intimate refuge, secretly tucked away amongst the thickets of the lush bushveld, where you can feel one with South Africa's nature. 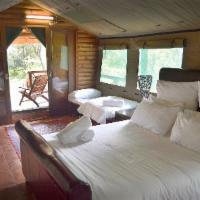 Each luxury tent features a private veranda, overlooking a waterhole. Experience the total peace of unrivalled nature, while watching a variety of Warthogs, Zebra, Blue Wildebeest and Giraffes coming to feed daily. Hornbills will be chasing after insects in the nearby branches, completely unaware that they are being watched. Under the communal thatched lapa or in the camp plunge pool, guests can relax and share their daily safari encounters. This is a place where strangers meet and leave as friends. The nature and animals were awesome!!! The tent setup was relaxing, eventhough the first night had some scary intrusion but with Louise's support could arrangements be made for a further save restfull week. Friendly service. Thank you for the amazing time our family could share there. In deed a memory that will last. Just absolutely loved the whole environment and the tents are looked after very very well.Love all the animals. In the bush, but so luxurious. Cannot wait to visit again. Maerua Luxury Safari Tents is 1.7km from the centre of Marloth Park , the nearest airport 75km (Kruger Mpumalanga International Airport). The view in front of Thonningii.